Look Up! : Bird-Watching in Your Own Backyard, by Annette LeBlanc Cate. Candlewick, 2013. This engaging introduction to bird-watching encourages kids to get outdoors with a sketchbook and really look around. Quirky, full-color illustrations portray dozens of birds chatting about their distinctive characteristics, including their color, shape, plumage, and beak and foot types. Interactive and enjoyable tips in this book bring an age-old hobby to new life for the next generation of bird-watchers. 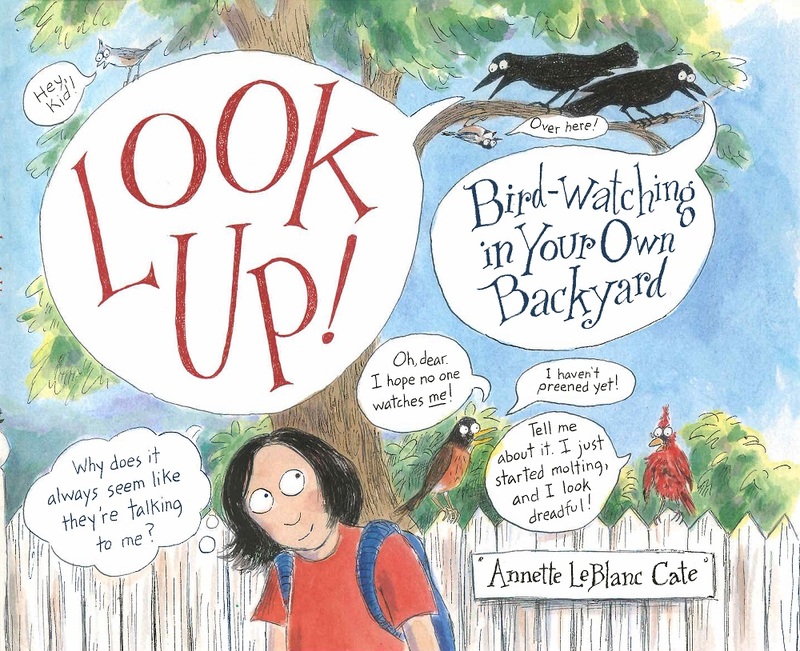 Pointing out that unless we know what is usually around us, we will fail to notice when something is different, Cate does not simply discuss looking at birds—she also provides her readers with a solid introduction on how to observe their environment.